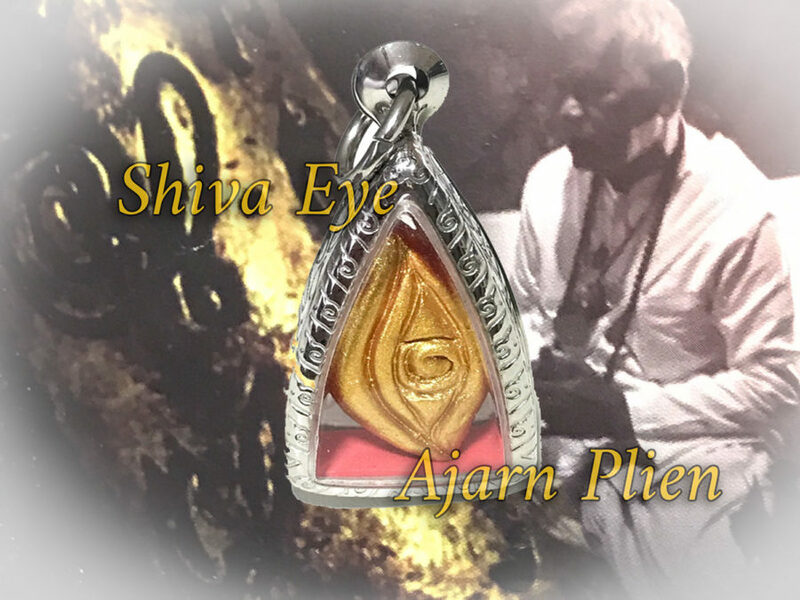 The Sacred Duang Ta Pra Isworn Shiva Eye for Maha Lap amulet with See Pheung Nam Man Prai insert in rear face, is one a a number of different Lucky Bringer amulets made from powerful Muan Sarn Sacred Powders by the Great Lay Master Ajarn Plien of the Dtamnak Dtak Sila Khao Or Southern Academy of Sorcery. Released in the ‘Run Maha Pokasap Khao Or’ edition on 27th September 2560 BE, with two Blessing ceremonies, the first being held on 27th September 2560 BE at Wat Khao Or with a host of the Khao Or Gaeji Ajarn Master Monks present to perform empowerment of the Muan Sarn and the amulets. 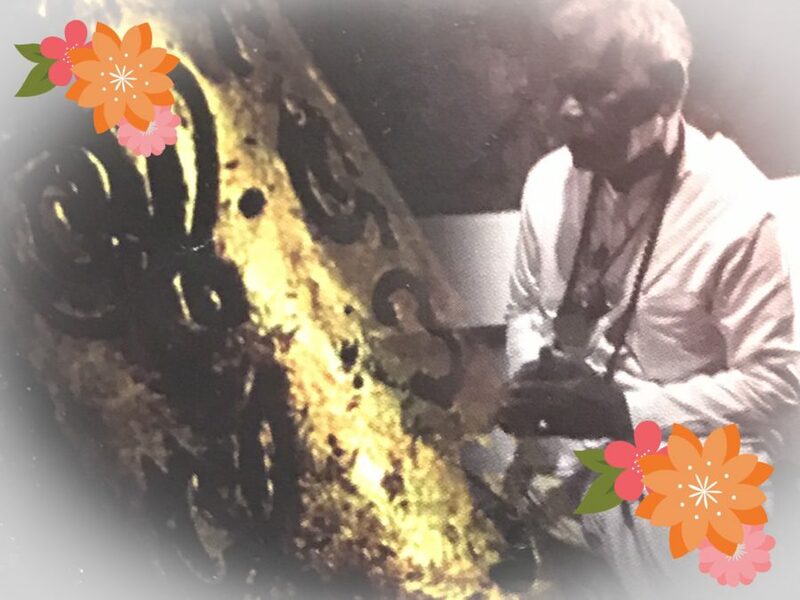 The amulet is made from a powerful admixture of Sacred Muan Sarn Powders, with gold painted front face, and, and has a piece of See Pheung Nam Man Prai of the Great Ajarn Pratueang inserted into the rear face. 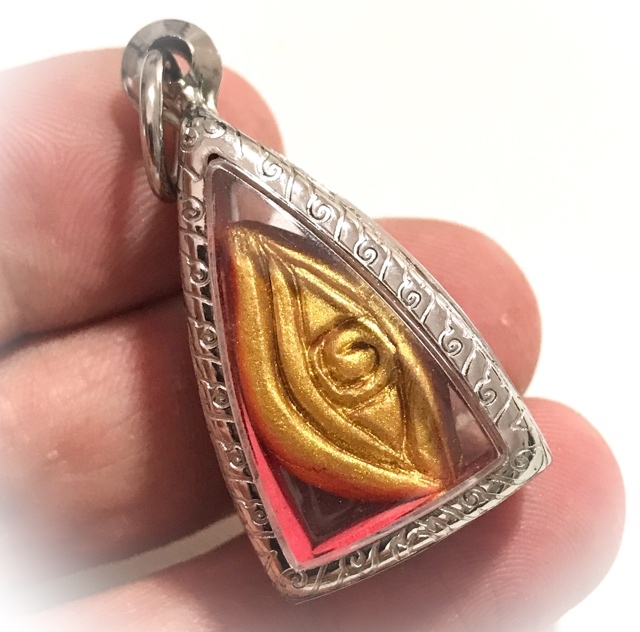 Stainless Steel Casing is included with the amulet in the price. Ajarn Plien is a Laymaster of the Khao Or southern Sorcery Lineage, who heads the Wat Don Sala temple laymasters of the Dtamnak Dtak Sila Khao Or Lineage, as the oldest living laymaster of the Luang Por Kong and Pra Ajarn Nam Lineage, which is the direct magical transmission lineage for Luang Phu Tuad of Wat Chang Hai, and for the Lineage of Ajarn Kong and Ajarn Tong Tao of Wat Khao Or. The Maha Pokasap Khao Or edition series is empowered primarily for Maha Lap Maha Sanaeh Maha Pokasap. Seven different models were released, but with differing design features. All models however perform the same function of wealth increase and change bad luck to good luck, and attract good luck, promotion, and better Karma. The seven different models were; 1. Daw Maha Lap Oval shaped star in the style of the famous daw Aathan of Luang Por Pina 2. Daw Plik Duang Karma Changer with Spiral Kranok Waves 3. Daw Unalome Sacred Khom letter U Yantra in Spiral Starshape 4. Daw Dork Mai Flower shaped star 5. Duang Ta Pra Isworn Shiva Eye 6. Om Pim Yai large letter Om 7. Om Pim Lek small letter Om. The Muan Sarn Sacred Powders are extremely powerful for the inclusion of a large number of broken up powdered amulets from Ajarn Chum Chai Kiree of the Dtamnak Dtak Sila Khao Or Southern Academy of Sorcery from the years 2484 BE to 2525 BE, mixed with a host of other powerful powders such as Pong Puttakun Nimit 2484 BE Powders of Ajarn Chu, Wan 108, Wan Dork Mai Mongkol 108, Relics from the four Deva Shrines in Bangkok, Holy Prayer Water from 108 Temples, Takrai (crubled residue) of 9 ancient Chedi Stupas, Sacred Din Bpoeng from nine Magical peat marshes..
Kayasiddhi Elemental Earth Magick Substances, Sacred Powders from the 2497 Indojin Amulet Edition of Wat Sutat, Pong Khaw Hniaw Dam black sticky rice powders empowered in the Khao Or Cave by Ajarn Plien during the black sticky rice eating ceremony, Pong Yant Suriyan Jantra powders from 2530 BE,Nam Man Pla Duyong (Dugong Tears), Muan Sarn Sacred Powders from Pra Ajarn Sri Ngern of Wat Don Sala, See Pheung Nam Man Prai of Ajarn Pratueang (inserted into the rear face of the amulet). 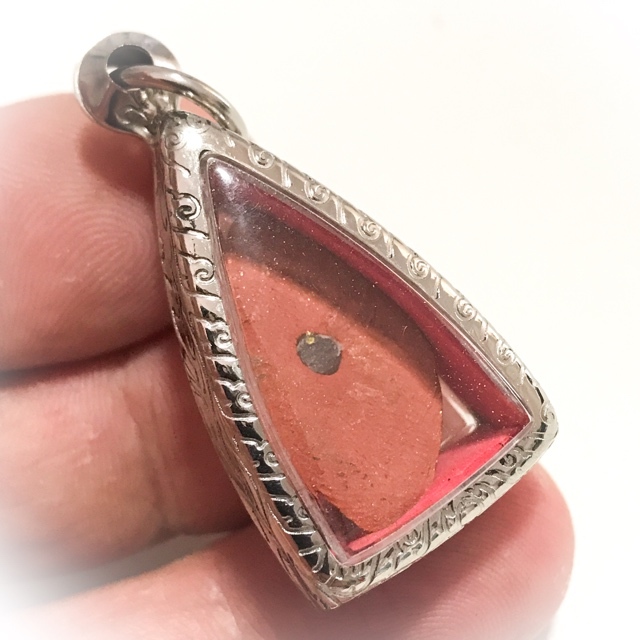 The amulets can be considered highly concentrated with magick, for their extremely powerful sacred powders within the admixture which have known to be used with many famous miracle amulets of the past, and are pure Khao Or tradition Magical amulets, empowered by the Master Monks of the Khao Or tradition at Wat Khao Or and a Secondary Empowerment in solo by Ajarn Plien at his Samnak .he amulets should bring professional success, lucky fortunes and wealth, promotion and mercy charm, with power of attraction, as well as Luck in Lottery. Apart from Hindu People and Thai Buddhist People Praying to Lord Shiva, the Thai Ruesi Sages Revere Lord Shiva, as the Root Guru and Highest of all Ruesi Sages. Lord Shiva is the Ruesi of all Ruesi, and is the reason for which the Ruesi like to wear a Tiger Skin in his honor. To Bucha Pra Isworn (Shiva) you must always Chant the Kata for making Bucha to Pra Pikanes (Ganesha) beforehand. Flower Offerings:- You can use Chrysanthemums, Lotus, Roses or any other kind of beautiful colorful flowers. Perfumed substances such as Jasmine, Herbal Extracts and aromatics plants and incense powders. Fruits with a fine aroma and taste (no bitter. sour or bland tasting fruits). Fruits should be offered unpeeled or segmented, but offered whole with the skins on them, such as a whole bunch of Bananas, or bunch of Lychee. Coconut, however should be cut open on the top, or poured into a Glass or other drinking vessel. Sweets and Puddings can (and should) also be given. It is forbidden to offer spicy or fermented foods or meats. Cereals, Grains and Vegetables such as sesame seeds, barley, puffed rice, Taro root, papyrus leaf,cassava or potato, string beans or beans, rice, lotus seeds, peppercorns and aromatic spices such as cinnamon, nutmeg or holy basil can be given. You can use one, or all of the above Kata Sansern for Bucha, depending on how much time you have. Translation; “Pra Siva – he who has a Naga for a necklace, who has 3 eyes and who wears ashes on the surface of his skin – he is the Highest of all Lords of Heaven. Who lives in Purity Eternally – who wears the tiger skin as a robe”.